Assignments are a Premium feature. Embark on an ocean voyage and colour this ancient Chinese sail boat called a junk, known for its unique sails and design. Wouldn't you want to sail away in this majestic Chinese junk? Find out how long this ship has been around as you add your artistic flair to this coloring page. This fishing coloring page includes a motor boat in the central image. If your child loves to take boat rides, this sailor coloring page will capture his imagination. Jamie will be on a fishing boat with her grandpa. Read all about her grandpa's boat and then answer the questions. Step aboard for a trip down the Nile on an Egyptian river boat! Add bright colors to this river scene and make up a story about travelling down the famous river. This career-focused worksheet is a hairdresser coloring page. Show your child a potential future career with this hairdresser coloring page. Learn about the career of a dairy farmer with this coloring page. Try this dairy farmer coloring page with your child. Pay tribute to our enlisted men and women by coloring this soldier coloring page. Encourage your child to dream big with these career coloring pages, like this veterinarian coloring page. This paramedic coloring page shows your child a career that he might not know about. Decorate this paramedic coloring page with your child. This roses coloring page combines flowers with stars for a rock-and-roll style worksheet. Decorate this roses coloring page on Valentine's Day or anyday. 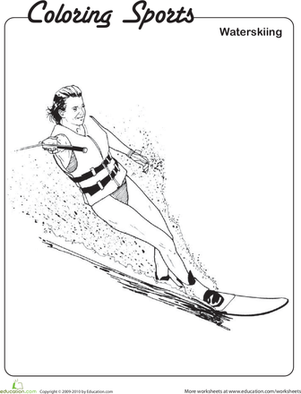 Your child can use their imagination to decorate this waterskiing coloring page. All they need are some crayons or colored pencils!